Everyone loved Paddington Bear when they were a child, right?! Well, imagine my excitement when I found out that Paddington Bear was coming to London in the form of statues scattered throughout the city, designed by various celebrities. In celebration of London’s art, culture and innovation, and the release of Paddington the movie – visitlondon.com, the NSPCC (National Society for the Prevention of Cruelty to Children) and STUDIOCANAL presented The Paddington Trail from November to December 2014. They distributed over 50 bears across London close to museums, parks, shops and key landmarks. I kept on seeing photographs of various friends with the statues on Facebook. They were clearly a popular attraction, as the bear near my office in Bank was always surrounded by people taking their photograph with him. One day, I saw that a small group of friends from the Serpentine Running Club had been for a jog around a number of the bears, and that made me think…I wonder if anyone has managed to visit every single statue in a single day on foot. ‘No’ was the answer (after all, who would be so crazy? ), so I decided to use my SVP100 Race Director experience to arrange a run with a few friends. The first challenge was to determine the optimal route and distance between all of the bears to see whether it was indeed possible. After downloading the Paddington Trail brochure, I set about capturing the postcode location of each bear. Having completed a Masters degree in Geographic Information Science many moons ago, I knew it was going to be possible to create a map of all the points. However, I also knew that it was going to be incredibly challenging to determine the optimal route. Just look up ‘Travelling Salesman Problem’ on the Internet, and you will see the mathematical complexities involved, particularly with over 50 bear locations. With the help of an ultra running friend (Rob Whitmarsh) from the Serpentine RC, and another friend from the Datchet Dashers (Jonathan Davies), we set about trying to determine a route between the locations. We came up with a few suggestions, with an overall distance of ~50 miles. As such, it sounded feasible as a run, but I really wanted to sense check the route. To do this, I contacted a former employer called Geoplan, who specialise in spatial problem solving. They very kindly took my list of postcode locations and provided a suggestion for the optimal order of bears. This was fortunately very close to one of our original ideas, so we fine tuned our route and calculated that the run would actually be closer to 48 miles. Ideally we would have started out at Heathrow T5, the location of the most Westerly bear. However, some of the bears located near the O2 Arena (the most Easterly location) were only accessible up until 5pm in the evening. Given the time constraints, we decided it would be more sensible to start at the O2 Arena and finish at Heathrow. That way, we could see most of the outdoor bears in daylight hours. So, the next thing…would anyone actually be interested in running around all the bears? I set up a Facebook event and socialised the idea on the Ultrarunning Community page, in addition to emailing the Serpentine RC. I was amazed by the enthusiastic response I received, and within a couple of days it appeared that I was not going to be running alone. Richard Cranswick had also shared the event with the Social Ultra community, and word started spreading. At one point, people started signing up at such a fast rate, it was necessary to change the privacy settings on Facebook as I was worried about the logistics of having too many people running through London. With the popularity of the concept growing, I decided that I’d need a small team to help out on the day, along with an objective for the run itself. 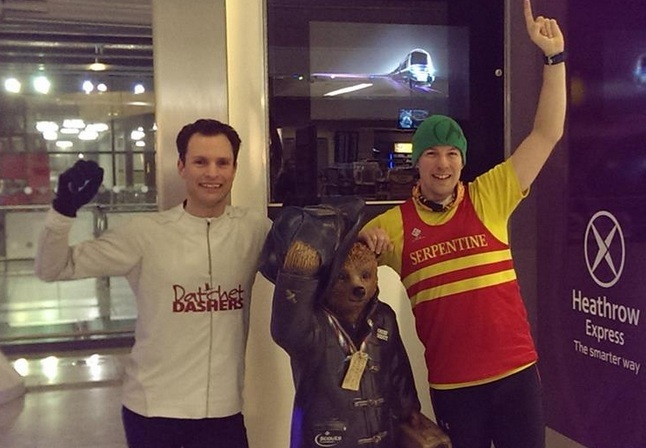 My enthusiastic friends Rob and Jonathan kindly volunteered their services, in addition to a chap from the Clapham Chasers running club called Adam Marcinowicz, who had previously cycled around every single bear. With Adam’s expert knowledge of the bear locations, Jonathan’s expert navigation skills, and Rob’s creative flair with a camera, we were ready to tackle the challenge. Given that the bears were going to be auctioned off in order to raise money for the NSPCC, it was also a good idea for us to try and raise a little money for this charity whilst we were running. As such, I had responsibility for the social media side of things, Tweeting throughout the day under #marmaladerun with the link to our fundraising page. We met on a bitterly cold Sunday morning on the 28th December, just outside the O2 Arena, unsure of how many people would actually turn up to participate. After negotiating with the security on the door to the arena, we were kindly let into the warmth to hang out by the coffee shop. Within a short space of time we started to see others dressed in fluorescent clothing, clearly there to join us. By 9am, we had a nice group form, and clad in the bright green colours of the NSPCC, we set off to find the first couple of bears within the O2. I could give you a very insightful breakdown of our progress throughout the day, but I’ll spare you the detail. However, our route can be seen in the map towards the bottom of this page. 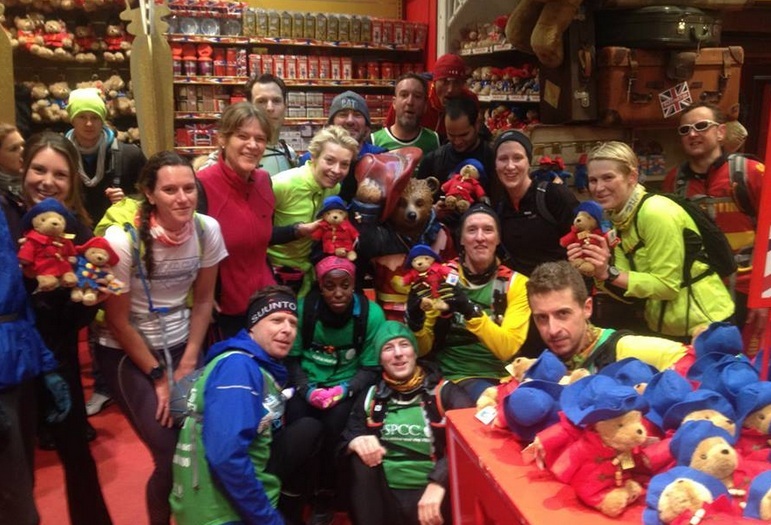 As we started running between the bears, we began picking up other runners. We all felt a bit like Forrest Gump in the scene where he is running across the US. At one point, there were 23 of us, which was a really nice number of runners to manage. Many more than that and it could have become problematic keeping everyone together. The group contained quite a mixture of capabilities, ranging from seasoned ultra runners, to those who had not really run further than a half marathon before. I’m not sure whether it was the excitement of seeing all the bears, or simply the excellent camaraderie on the day, but the miles flew by. Before long I heard people saying “this is the furthest I’ve ever run” and the bears certainly motivated one of the runners (David Evans) to complete his first ever ultra distance (i.e. over 26.2 miles). So, to try and keep this write-up as short as possible, I’ll summarise my personal highlights and a few of the more difficult moments. – Seeing all the Paddington bears in one day! – Running along a grassy verge whilst ducking under road signs on the approach to Heathrow T5. All in all, the run was almost exactly 49 miles in length (you can see the route below). Jonathan and I arrived at Heathrow T5 after 10 hours and 15 minutes worth of running, and Adam arrived approximately 50 minutes later. We had visited a total of 56 Paddington bears, with photographs taken at each location. 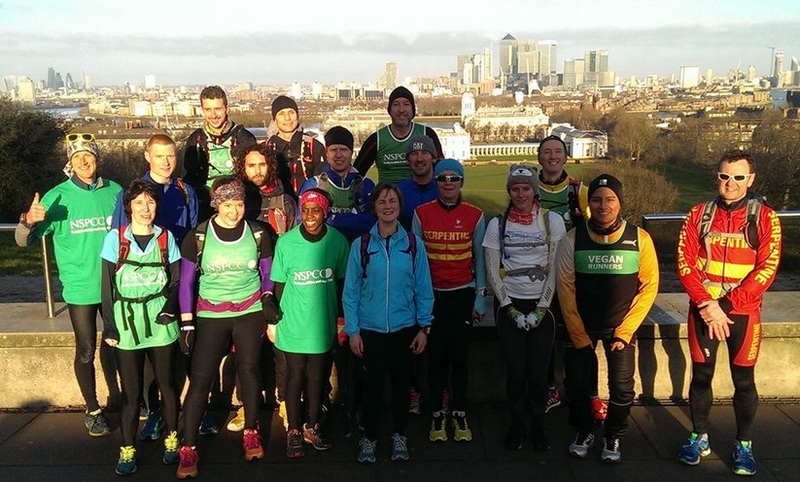 It had been a fantastic day, and we were lucky to have been joined for most of the run by a lovely group of runners. Everyone thoroughly enjoyed the challenge and there is now talk of doing something similar around Shaun the Sheep in London and Bristol! Paddington Bear, you have inspired us! 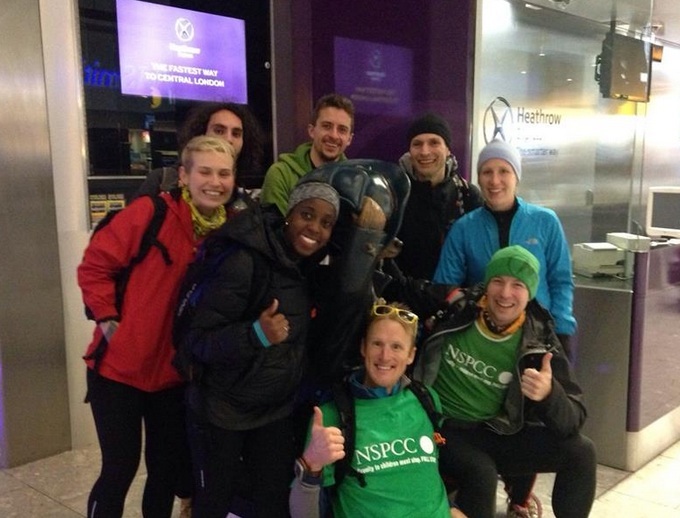 If you enjoyed reading about this challenge, please feel free to donate to NSPCC through the following link: https://www.justgiving.com/teams/Marmalade – you can also watch a quick video of our exploits below.